Who knows why EA opted for a fragmented release schedule for DICE’s Battlefield 5, all we know is that it’s tripping some people who want to play the latest military shooter but can’t figure out when the game actually comes out. We’re here to help. Last month EA released a release schedule for Battlefield 5. This is just for the launch mind you, not some scheduled content calendar. Players who want to play Battlefield 5 the earliest can do so today through EA’s Origin Access Premier subscription service. Members can play the full game, unrestricted starting today. What’s more, even if you’re just a Origin Access Basic member or EA Access member on Xbox One, you can play a 10-hour trial of Battlefield 5 starting today. If you aren’t a member of EA’s subscription service and you plan on purchasing your copy then you’ll be able to play Battlefield 5 sometime within the next two weeks depending on which version you purchase. That’s right, even the actual retail launch for Battlefield 5 is fragmented. 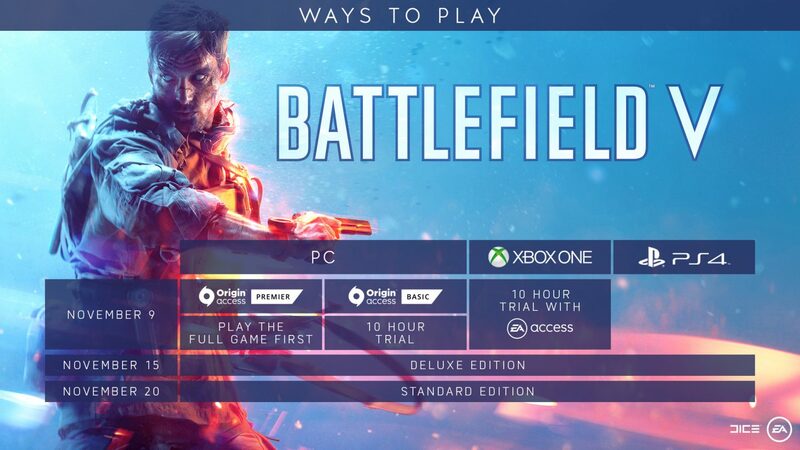 Players who purchase the Deluxe Edition, which costs $79.99, can play Battlefield 5 on November 15. That’s five days before the official official retail launch of November 20 when standard edition players can finally play the game. Basically, for $14.99 (the cost of EA’s Origin Access Premier membership) players can get their hands-on Battlefield 5 two weeks earlier than those who pay $60. If this is a way for EA to get players to join its subscription service well it’s not a bad deal. Too bad it’s also because EA chose such a byzantine release structure for Battlefield 5 in the first place. It’s all a bit much if you ask me, but this is the world we live in apparently. We recently had a chance to go to Sweden to play Battlefield 5 and our review is in-progress. Check out our interview with DICE and our Battlefield 5 Everything We Know Guide for more info on the release date and more. Next Postpremiers tests et avis, la réédition de la PS1 vaut-elle le coup ?